No one is really sure what little Madeleine is training for. Her workouts are becoming more intense with a sprinkle of intensity and a dab of ferocity. She blows out of the gates every morning making her first run at the stairs. She swings around the corner laughing manically and hits the stairs at full speed. One by one she knocks them down as if there’s an invisible stopwatch in her head logging each passing second. Sometimes she slips or stumbles, but that seems only to reinvigorate her drive for the top. 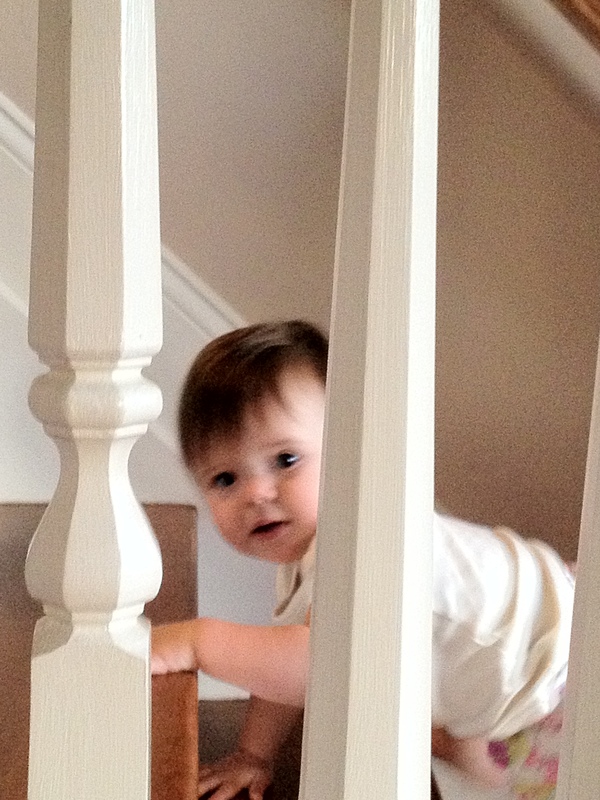 Finally the triumphant giggling starts because once again, Maddie has grabbed the gold and conquered another stairwell. The only problem is that there really isn’t much to do once you get to the top of the stairs except pick up the baby and go back down. If you don’t block the stairwell immediately, Maddie is back on them in a flash – ready for another shot at stair climbing glory and immortality. Maddie is up to five climbs a day now and there’s no telling how many she would do if she had unlimited access to the stairs. Since Maddie has mastered the art of climbing of the stairs, we must now make strides in teaching her how to go down. It’s a daunting task, but we have little choice in the matter. This entry was posted in Baby, Child Development, Children, Family, Olympics, Parenting, Physical Training and tagged baby, Climbing, family, Gold Medal, Olympics, Parenting, Stair climbing, Stairway.